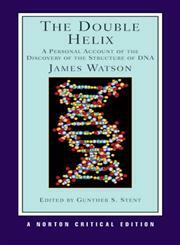 The Title "The Double Helix: A Personal Account of the Discovery of the Structure of DNA (Norton Critical Editions) " is written by James D. Watson . This book was published in the year 1980. The ISBN number 0393950751|9780393950755 is assigned to the Paperback version of this title. The publisher of this title is W.W. Norton & Co. Inc.. We have about 5170 other great books from this publisher. The Double Helix: A Personal Account of the Discovery of the Structure of DNA (Norton Critical Editions) is currently Available with us.